To adjust the Doubler settings, open the relevant Process Control Panel by selecting the Doubler's Process Control block or the Doubler output and pressing the P key. You can repeatedly try modifying the parameters in the Control Panel and listening to the result. The Doubler control panel can remain open, the controls adjusted and processing run while signals are playing. See Rendering and background processing to determine whether audio is rendered automatically after changes are made, or needs some action from you before it can be played. Presets allow you to use Factory or previously saved settings, and to save your own settings. There is a Compare function to compare saved versions of a Process, and a Pinning control to keep this Process Control Panel open. Each of the controls shown has a "pop-up" explanation which will appear shortly after hovering the mouse pointer over a slider control or parameter display box, so the controls won't be described in this User Guide, with the exception of the Channel controls. Doubler can operate in mono or stereo. The Settings panel shows the settings that will be applied to one or both channels, depending on what is selected in the Channel Controls section. If you change the number of Output Channels to 2 (using the adjacent drop down menu) the panel will display slightly different controls (lower image at right). You will also see the number of channels in the output track switch to two, but the audio in the new second channel will not be generated until the process is run and renders it. 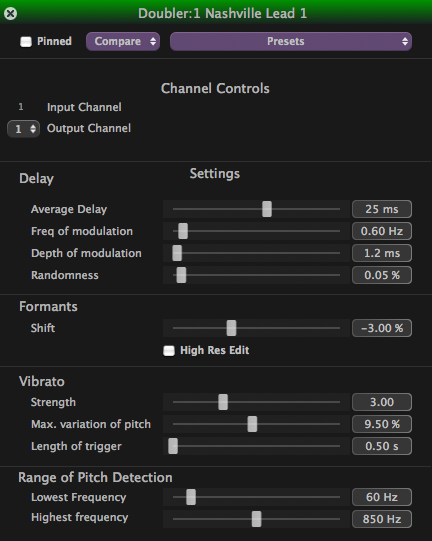 Mono Inputs: you can select 1 or 2 output channels. With two output channels, a selector control appears to choose which channel's settings are displayed and adjustable. Stereo Inputs : you can select one or two output channels. With a stereo input and 2 channel (stereo) output you have the further option of phase locking the editing in the two channels. i.e. the editing will be done the same in both channels. Lock Phase: ON - When the processing is run, only the Settings shown (when either Channel 1 or 2 is selected) will be applied to process both Output channels and the editing will keep the channels phase-locked. i.e. If Channel 1 is selected when processing, then the Channel 1 Settings will be applied to process both input channels. Similarly, if Channel 2 is selected when processing, then the Channel 2 Settings will be applied to process both input channels. To audition the Left Output channel and adjust its Settings: Pan the Output signal track left (in the Session's Track Control Panel) and select Channel 1 in the drop down under Selected Settings in the Doubler Control Panel shown above. The setting controls will then be for for Channel 1 (which is output to the left). To audition the Right Output channel and adjust its Settings: Pan the Output signal track right (in the Session's Track Control Panel) and select Channel 2 in the drop down under Selected Settings. The settings controls will then be for Channel 2 (which is output to the right). To hear the left or right outputs with the input, solo both Input and Output tracks (which can be done with the E key). To hear the Left and Right Output signals together, move the Pan control back to the centre.